Braden competed in a Triathlon today! Yes, you read that right. Braden has been swimming since he was about a year old. When we lived in Jakarta, we would go swimming every Sunday at the American Club. There, Braden would sit on the steps and watch all of us in the pool together. One day, he just jumped in and swam right to us. Nothing could stop him after that. I believe I’ve mentioned in a past post how other adults would panic seeing a baby swimming, and one even jumped in fully clothed, to “save” him. As for biking, at age five we took off his training wheels. Through the years, we had to have specialty bikes made for him so he could brake with his feet, as he couldn’t quite understand how to use the hand brakes. And then one day, he just could use the regular brakes, and he has been biking the hills of Sunriver and the streets of Shanghai and Bangkok ever since. Running…well, he sure was a runner as a kid. In fact, he never stopped running! Of course, once running was seen as an exercise, it lost its fun, and he hasn’t been a big fan of that since. 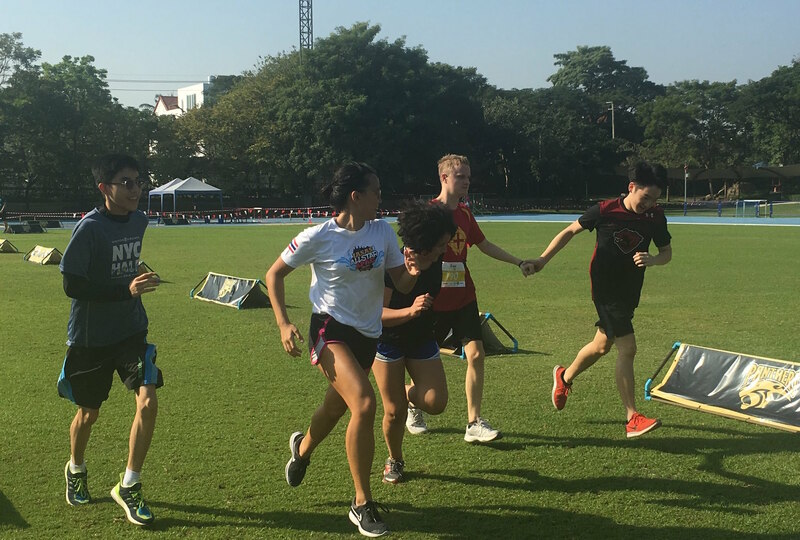 Our school, International School Bangkok (ISB) puts on an annual triathlon. This is quite the event, complete with bibs, running chips, race marshalls, etc. Honestly, it is very impressive, and one of the many reasons we love teaching internationally. So, I asked the organizers of the event if this was a possibility, and they answered with a resounding YES. Then the real work began. I reached out to my friends Phil and Rich, who are sponsors of a high school club called InvisAbilities. This club started just this year by a group of students who want to “create increased empathy and understanding of our community by promoting awareness, advocacy, and support for individuals with learning differences.” These high school students have been hanging out with my students and have interacted with them whenever they get the chance. 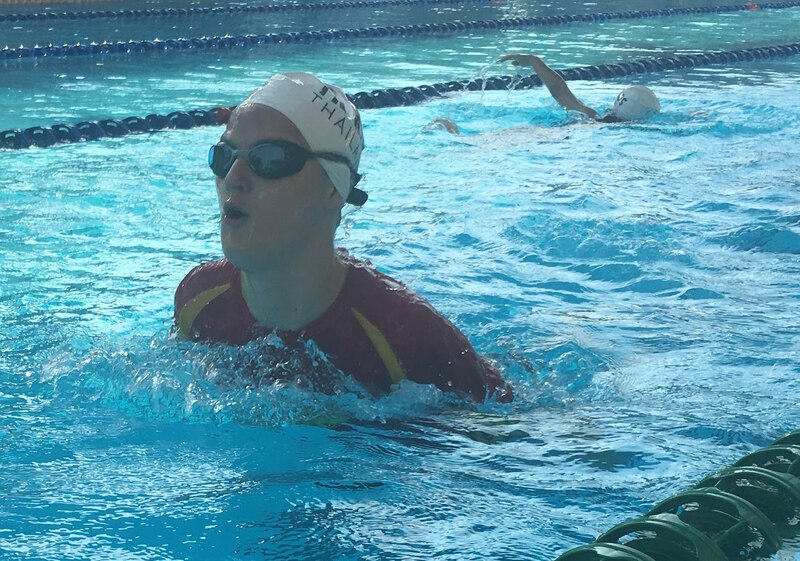 We thought this triathlon would be a fantastic opportunity for everyone. Each student, including Braden, was matched with a buddy, and the training began. We had to think carefully about each child and what he/she needed. I have students who cannot swim, so they used pool noodles to stay afloat, and their buddies pulled them along. For the bike part, we had one student on a tag-along bike while another rode in a child’s seat in the back of a regular bike. The other students rode their own bikes, with their buddies on the bike beside them. In other words, accommodations had to be made. But the important part here is that these accommodations were accepted. As you know, Braden has been feeling ill. However, he was feeling fine this morning, so we took the chance and had him attend. He was matched with two buddies; Emmie and David. Emmie was with Braden during the swim. Dolphin Style. It’s a thing. “Oh, he’s fine,” I replied. “He just likes to swim backward and upside down.” I think she was a bit perplexed by that. He transitioned to the bike and took his own sweet time putting on his socks and shoes. I was on the sidelines yelling, “Geez, hurry up, Braden! Put on your shoes!” Mike was rolling his eyes at me and calling me a Tiger mom. Braden’s buddy, David, said Braden did great on the bike. They biked 5.5 km. around our neighborhood. We bike this route with Braden all the time, so he knows it quite well. By the time Braden finished biking, he was definitely in last-place. Then came the “run.” At this point, Emmie, David, and two other members from the club joined Braden. The run was only 1.1 km, but Braden was not running. I had to laugh when I saw the students running backward in front of him to encourage him. That’s a normal thing to do, right? But Braden thinks that means he should run backward too, so the next thing I know, they’re all running backward! I was worried they were going to clean up the whole event before Braden crossed the finish line. The group disappeared for quite a while, and I was beginning to wonder if he was going to finish…when I finally saw his red shirt in the distance with all four kids running with him. The announcers, who know our family, were yelling, “Good job, Braden! You’re a Triathlete!” and the rest of us were cheering. I had to fight back the tears…and I did…until I turned around and saw another mother crying. She was so touched. At that moment, I realized that Braden is such an important part of our community. He is well loved and supported, and everyone was cheering him on. This is inclusion. I’m so proud of Braden and all my students who participated today. As far as they’re concerned, they all came in first place. I’d like to give a big shout out to the organizers of this event, especially Kellie Alexander and Ken Hansberry, who didn’t even blink an eye when asked if our kids could participate. To Phil and Rich and to the InvisAbilities buddies- you guys are the best. To Miho for all your help. To Katie and Mel for letting me borrow your bikes, and to the parents who trusted us with their children today. Trust me…I know how hard that is! I keep trying to figure out how to describe today. Today? Today was a win! Way to go, Mr. Triathlete! Such a wonderful event! 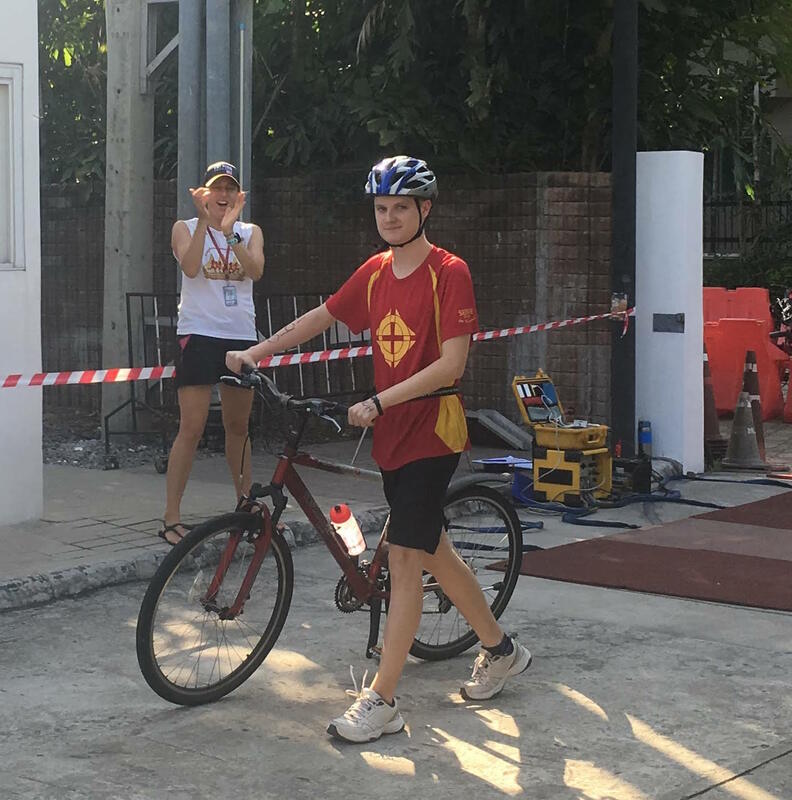 Although some might want you to “Go Faster” Braden, it is also lovely just to see you out there participating! Looking forward to participating in future events with the entire Boll family! It’s that competitive nature in me!